Description: DISCONTINUED. 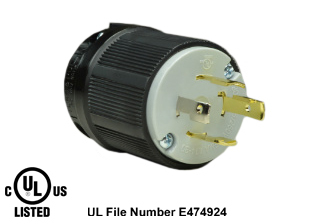 USE NEW REPLACEMENT DESIGN # L515-AN LISTED BELOW IN RELATED PRODUCTS. 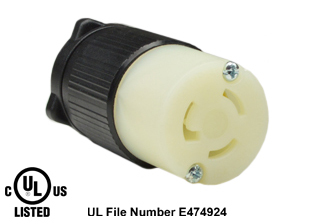 15A-125V (NEMA L5-15P) LOCKING ANGLE PLUG, SPECIFICATION GRADE. BLACK / WHITE. Note: Accepts 18/3-12/3 AWG Size Conductors. 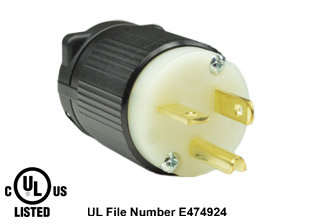 Strain Relief (Cord Grip Range) = 0.300-.650 Dia. .
15A-125V (NEMA L5-15P) LOCKING PLUG, SPECIFICATION GRADE. BLACK / WHITE. 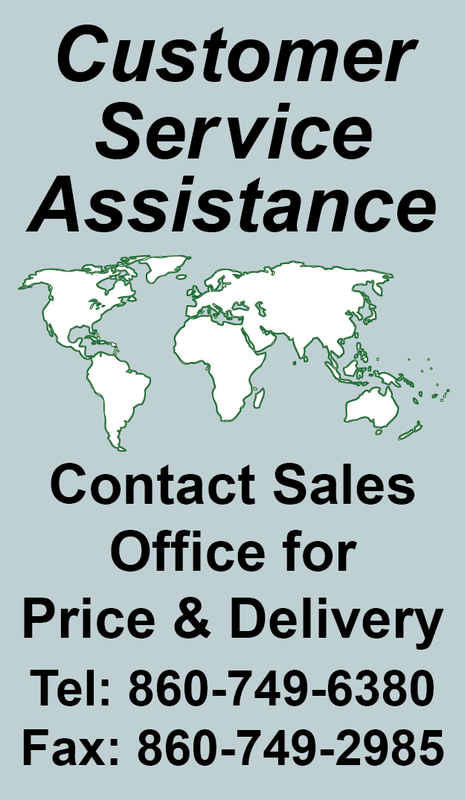 Note: Accepts 18/3-12/3 AWG Size Conductors. Strain Relief (Cord Grip Range) = 0.300"-.650" Dia. 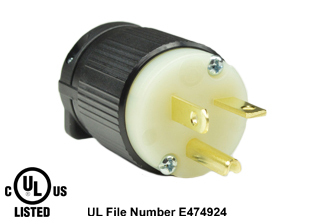 15A-125V (NEMA L5-15R) LOCKING CONNECTOR, SPECIFICATION GRADE. BLACK / WHITE. 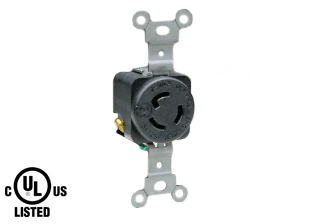 15A-125V (NEMA L5-15P) LOCKING FLANGED PANEL MOUNT POWER INLET, SPECIFICATION GRADE. WHITE. 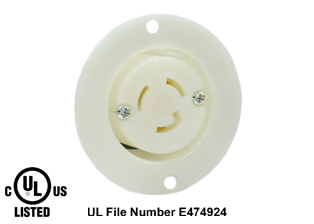 15A-125V (NEMA L5-15R) LOCKING FLANGED PANEL MOUNT POWER OUTLET, SPECIFICATION GRADE. WHITE. 15A-125V (NEMA L5-15R) DUPLEX LOCKING OUTLET (2P+E). BLACK. 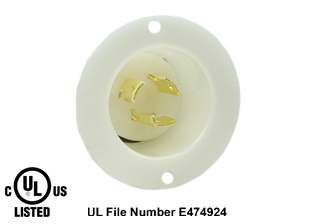 15A-125V (NEMA L5-15R) LOCKING OUTLET (2P+E). BLACK. 15A-125V NEMA L5-15P (TURN/LOCK PLUG) POWER CORD, STRIPPED ENDS, 2.5 METERS (8FT.-2IN.) (98") LONG. BLACK. 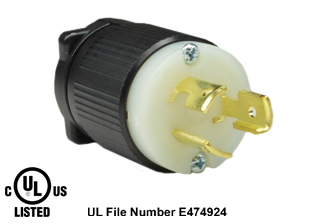 15A-250V (NEMA L6-15P) LOCKING PLUG, SPECIFICATION GRADE. BLACK / WHITE. 20A-125V (NEMA L5-20P) LOCKING PLUG (2P+E), SPECIFICATION GRADE. BLACK / GRAY. Note: AcceptS 14/3, 12/3, 10/3 AWG Size Conductors. Strain Relief (Cord Grip Range)= 0.375"-1.156" DIA. 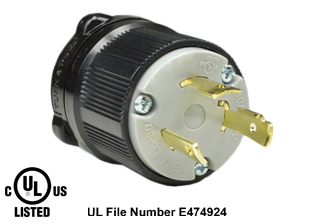 20A-250V (NEMA L6-20P) LOCKING PLUG (2P+E), SPECIFICATION GRADE. BLACK / GRAY. Note: AcceptS 14/3, 12/3, 10/3 AWG Size Conductors. 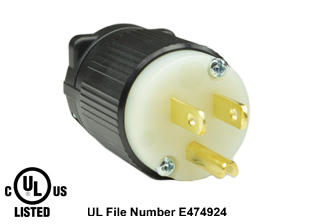 Strain Relief (Cord Grip Range)= 0.375"-1.156" DIA..
30A-125V (NEMA L5-30P) LOCKING PLUG (2P+E), SPECIFICATION GRADE. BLACK / GRAY. 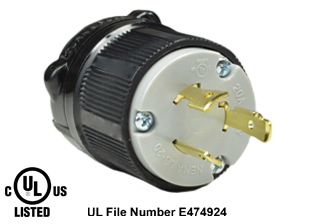 30A-250V (NEMA L6-30P) LOCKING PLUG (2P+E), SPECIFICATION GRADE. BLACK / GRAY. 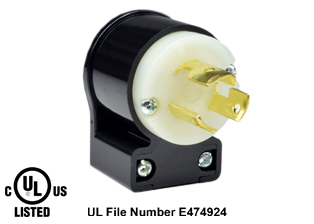 20A-125/250V (NEMA L14-20P) LOCKING PLUG (3P+E), SPECIFICATION GRADE. BLACK / GRAY. Note: Accepts 14/3, 12/3, 10/3 AWG Conductors. Strain Relief (Cord Grip Range)= 0.375"-1.156" DIA..
30A-125/250V (NEMA L14-30P) LOCKING PLUG (3P+E), SPECIFICATION GRADE. BLACK / GRAY. Note: Accepts 14/3, 12/3, 10/3 AWG Conductors. Strain Relief (Cord Grip Range)= 0.375"-1.156" DIA. 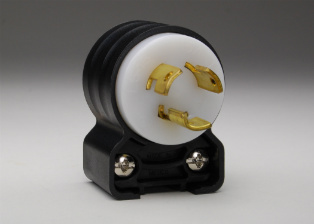 20A-125V (NEMA 5-20P) PLUG, SPECIFICATION GRADE. BLACK / WHITE. 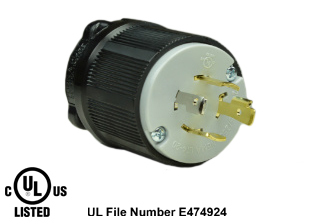 15A-250V (NEMA 6-15P) PLUG, SPECIFICATION GRADE. BLACK / WHITE. Note. 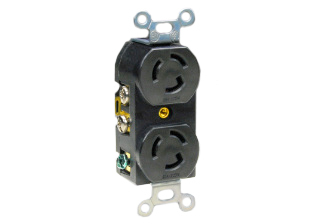 Nema 6-15P Plugs mate with Nema 6-15R (15A-250V) & Nema 6-20R (20A-250V) Receptacles, Connectors, Outlets. 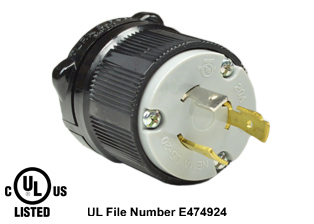 20A-250V (NEMA 6-20P) PLUG, SPECIFICATION GRADE. BLACK / WHITE.